Made from extra strength polycarbonate to provide strength and enhanced flexibility. Uniquely angled tines provide easy pickup with less spilling. Designed for long-lasting use around the farm, ranch and home. Features a flatter fork design without the “basket” that Dura Pitch has. 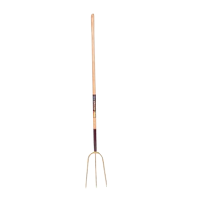 52″ wood handle, fork head measures 13-1/8″L x 15-1/8″W. 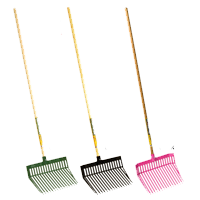 A variety of heavy duty push brooms and corn brooms, from a variety of different companies.